Verizon’s support documents say you should expect to see a new software button arrangement (and design), lock screen notifications, smart lock (using proximity to other devices to auto-unlock the tablet), the new notification screen design, the much-hated Interruptions feature that replaces Silent mode, floating action buttons everywhere, screen pinning, search in Settings, multi-user accounts accessible from the notification panel, as well as an “Avoid bad Wi-Fi connections” item in Settings. As always, since the update is delivered over-the-air, it will roll out in stages. 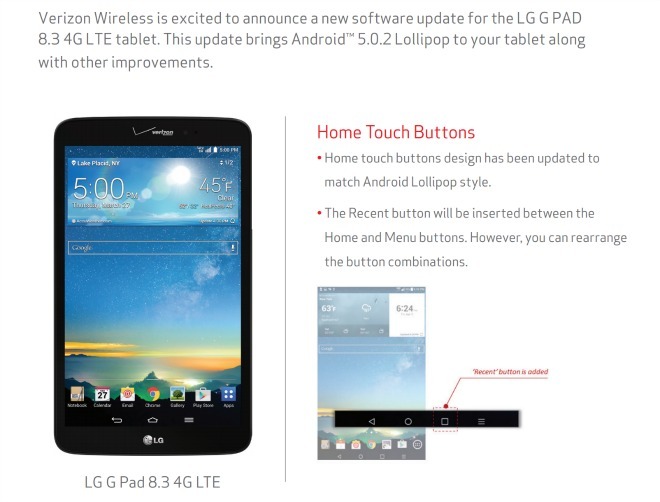 This means it will be a few days (if not even weeks) until all of Verizon’s G Pad 8.3 units get it. After applying the update, your tablet will be on software version VK81035A.